I’ve been conceptually familiar with six-degree-of-freedom (6DoF) shooters for a while, but I’d never played one before. I was passingly aware of Descent, but it wasn’t a game that really bore any particular significance to me. 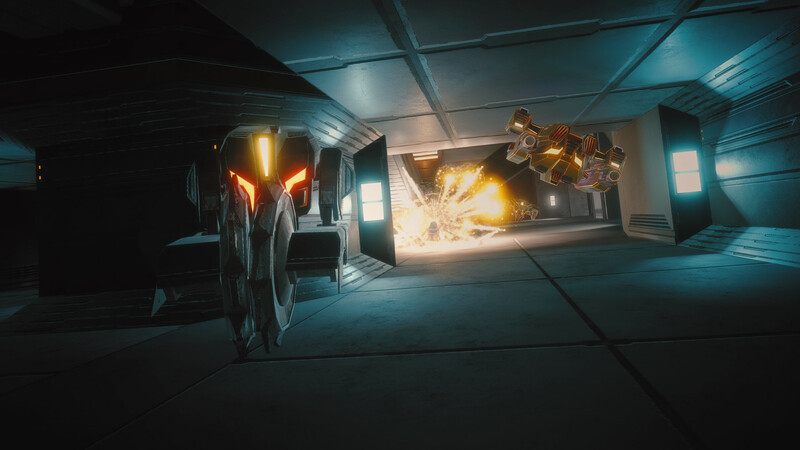 As such, it was with very little direct familiarity with the genre that I went into Overload, a new 6DoF shooter from the creators of Descent. For those unfamiliar with the name, a 6DoF shooter is a first-person shooter where the character can freely move forwards, backwards and side to side as well as up and down, and free rotation along all three axes of rotation. Having never played a game of the sort before, it took some time for me to adjust to the controls in Overload. The tutorial definitely helped, giving me a chance to learn how to navigate through a level and how movement in general works. There’s several different primary and secondary weapons to find throughout the levels, which all behave differently and have two different resource pools to draw from. Using one weapon enough gains it experience and eventually levels it up, slightly changing its properties and making it more effective. 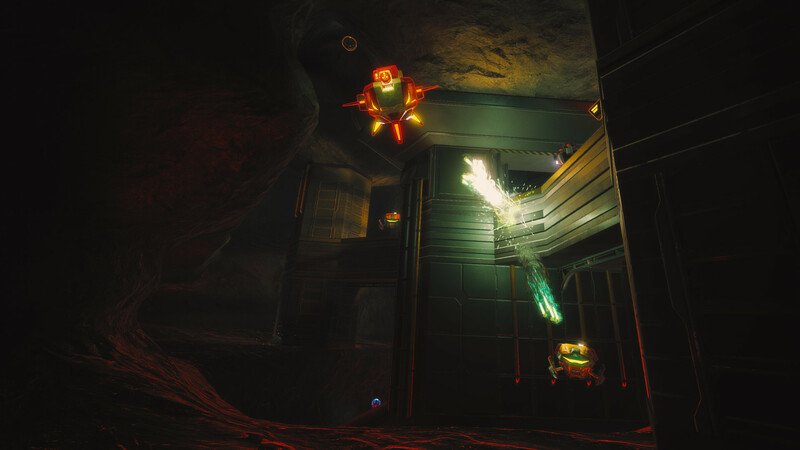 The secondary weapons have their own resource pools to draw from, and for each there are pickups scattered throughout the level to get more of everything. The majority of my time was spent in challenge mode, doing a standard survival challenge against increasingly populous waves of enemies. 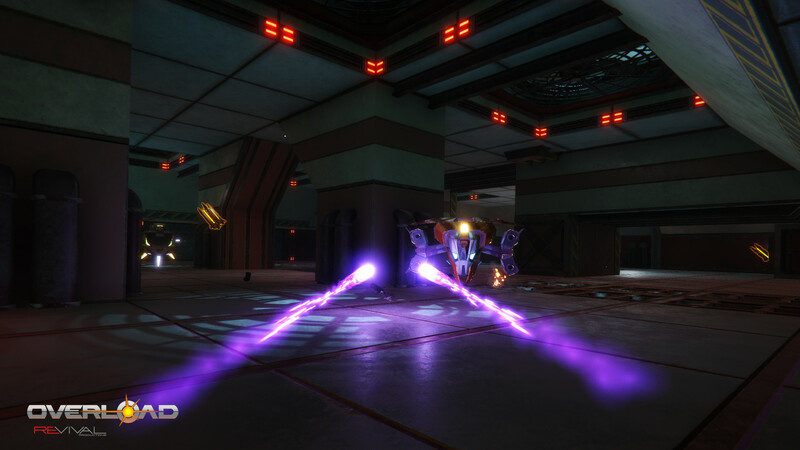 Each enemy uses one of the playable weapons, and killing them drops it for you to pick up. Once you get to know the different enemies you’ll be able to recognize which weapon they have, which will help inform how you should engage them. Once it gets more hectic and you properly understand the controls it becomes really enjoyable, as you easily navigate the areas and avoid everything coming to kill you. The controls and gameplay are very smooth and fluid, which is also a big part of what makes it so enjoyable. There’s more to the full game, such as a story mode, but based on what I played Overload is a lot of fun. The 6DoF gameplay is very strange if you’ve never played a game like it, but once you get the hang of it the control is extremely fluid and smooth. I may pick up the full game at some point, to get another shot at the gameplay and to see what the story is like. If you’re interested in checking it out, it’s available on Steam and GOG, with a PS4 and Xbox One version coming soon.